New York has Central Park and San Francisco has the Golden Gate Park. But did you know that New Orleans has one of the oldest urban parks in the United States? Most tourists don’t make it past Bourdon Street or Saint Charles Street. I don’t blame them because the food and music could keep me there for days as well. However, if you’re an outdoor enthusiast or fitness freak then hop on the Canal Street trolley and head to the end of the line! City Park is a 1,300-acre outdoor oasis located within the heart of New Orleans that has enchanted locals and visitors alike since 1854. City Park has something to offer to everyone. You can enjoy the numerous biking, jogging, and walking paths, play a game of tennis on one of the 26 tennis courts, stop and smell the roses at the Botanical Gardens, or amble around the free Besthoff Sculpture Garden. One of the highlights of the park is the one-of-a-kind antique wooden carousel located in the family friendly Carousel Gardens Amusement Park for over 100 years! City Park is home to the world’s largest stand of mature live oaks, which includes one grand oak that is over 800 years old. The park itself contains over 20,000 trees. The park lost about 2,000 trees from Hurricane Katrina, but the park has planted more than 5,000 trees to replace the lost trees. The park contains a wide variety of trees, including oak, bald cypress, magnolia, slash pine and sweet gum. City Park is a fitness freaks dream-come-true! I was head over heels in love with the park! The park contains a large 400-meter polyurethane track that was built for the 1992 Olympic Trials and numerous trails and paths over the vast fields or amongst the 60 acre forest. You can ride your own bicycle or rent a bike at the Boat House to enjoy the miles of bike paths. My absolute favorite part of the park (and I may or may not have shed a few tears over) was the outdoor gym. Think playground for adults! The park didn’t have one, but two outdoor gyms! Be still my little heart! The park also has an 18-hole golf course, mini-golf course and a disc-golf course. The New Orleans Museum of Art is located within the park as well. While most of the park is free, NOMA has an admission fee ($10/adult). I didn’t have time to visit NOMA, but the museum is home to over 40,000 permanent objects and numerous special exhibitions throughout the year. Outside of NOMA and across the street from the Botanical Gardens, is the 5-acre Sydney and Walda Besthoff Sculpture Garden that is home to 60 unique sculptures valued at over $25 million. The sculptures are scrawled across various footpaths surrounded by colorful flowers and 200-year-old oak trees. City Park was once the site of Allard Plantation, but was left to the City of New Orleans by John McDonough in 1850. In the early 1900s the City Park Improvement Association built several notable landmarks including the Casino, Popp Bandstand, and the Issac Delgado Museum of Art. Many of the current day attractions were built through the Works Progress Administration, a program enacted by President Franklin D. Roosevelt as part of the New Deal. In the early decades of the park, only white residents were allowed to enjoy it. In 1958 the park became open to all. Hurricane Katrina caused massive damage to the park in 2005. Flooding up to 8 feet in sections of the park occurred due to the hurricane and subsequent breach of the Federal Levee System. The park incurred over $43 million in damages. Much of it has been repaired, but there are still areas of construction. I only had a couple of hours to explore the park after sitting in a conference hall all day. City Park is easy to reach from the French Quarter by hopping on the Canal Street line and riding to the end. From the last trolley stop, you just walk across the street! During my couple hours at the park, I was only able to skim the top of the park. I still have hundreds of acres to explore! I spent some time walking around the various bike paths. It was extremely hot and humid for this Maine girl, so I quickly sought out shade to cool off. I found myself walking down one of the streets surrounded by beautiful old oak trees with hanging branches covering the roadway. It was exactly how I pictured the south. After walking in the shade for a bit, I came across a few wildflower fields. The area made me want to grab my book and lay in the grass reading for the rest of the afternoon. 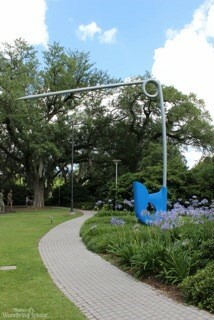 I made my way to the Sculpture Garden and the Botanical Gardens. I skipped the Botanical Gardens because of time and the admission fee. Instead, I opted for the free Sculpture Garden. I spent about 30 minutes exploring the garden and enjoying the creative and unique art (and playing with the ducks). The sun was starting to set so I took it was cue to head back to the trolley stop. On my trip to New Orleans I fell head over heels for the city and City Park just sealed the deal for me. As an endurance sport athlete, I need any area where I can train. City Park offers just that area I would need to train, except that it lacks a swimming pool. I’m excited to head back to New Orleans to explore the park more in the future. I was extremely excited to find out that there is a horse farm located within the park. A horse farm in the middle of a city? Amazing! As I mentioned in a couple of my other New Orleans posts, I was in New Orleans for a work conference and to visit the Tulane University School of Public Health as I am interested in one of their PhD programs. Not only did I really enjoy my visit with Tulane, but New Orleans totally stole my heart and City Park was one of the main reasons. Next time you find yourself in New Orleans with the need to burn off a few hurricanes and beignets, I highly recommend a visit to City Park. The Audubon Park located in the historic uptown area across from Tulane University’s main campus is another great area to escape the concrete and enjoy some nature. 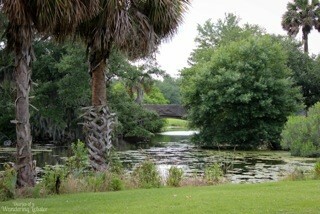 The Audubon Park is home to a 1.8 mile walking/jogging path, a swimming pool, a golf course, and a horse farm. It is adjacent to the Audubon Zoo. I personally did not spend much time here, but again, I’m extremely excited to see so much green space in the city! Have you been to New Orleans? Did you head to any of the parks?